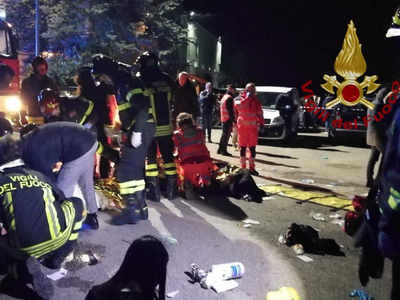 ROME: Six people died in a stampede at a nightclub near Ancona in central Italy after panic erupted in the early hours of Saturday morning, firefighters said. "The cause may have been the dispersal of a stinging substance, the young people fled and trampled over each other. Sadly, six people died and dozens are injured," the fire service said in a statement on Twitter. The accident happened around 1.00am (0000 GMT). Published on Sat, 08 Dec 2018 05:05:29 GMT, © All rights reserved by the publisher.